On the site of St Helen’s Chapel (Ermita de Santa Elena) the remains of a 1st century Roman in antis temple have been found, along with vestiges of an indigenous necropolis. 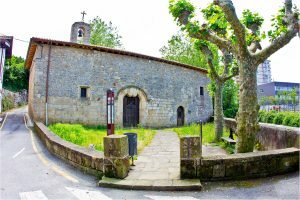 The present building is otherwise Gipuzkoa’s only church dating from the 10th century. The chapel is nowadays used for museum purposes, as a complementary building of the Oiasso Roman Museum. Besides the aforementioned Roman temple, the rectangular edifice also houses collections of noteworthy objects that tell a great deal about the lifestyle of its occupants, very much in tune with the urban life of other Roman cities on the Atlantic coast.